The U.S.S. Aeolus (ARC-3), named for the mythological Greek ruler of the winds, was built by the Walsh-Kaiser Shipbuilding Company at Providence, Rhode Island, and originally commissioned as an attack cargo ship, the U.S.S. Turandot (AKA-47) on June 18, 1945. Although she did not see action in World War II, Turandot was assigned to the United State Pacific Fleet and participated in the “Magic Carpet” operations that returned American troops from Saipan to the United States. Turandot was decommissioned on March 21, 1946, and her name was struck from the Navy list on April 17, 1947. On November 4, 1954, Turandot was reacquired by the Navy for conversion to a cable-repair ship. 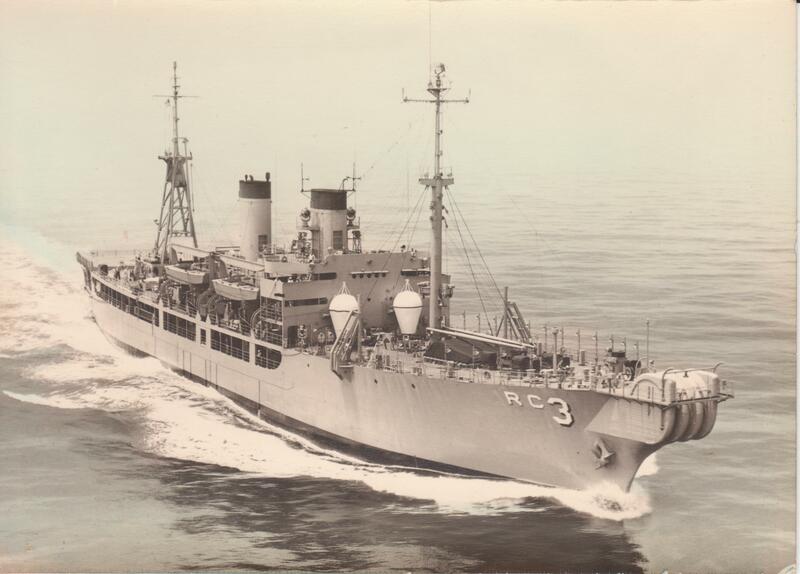 After being modified for her new role as “the world’s most modern cable layer” by the Bethlehem Steel Company (Baltimore, Maryland), she was renamed Aeolus and designated ARC-3 on March 17, 1955. She was placed in commission at Baltimore on March 14, 1955, with Commander Merrill M. Sanford in command. During her first year, Aeolusoperated along the Atlantic coast and in the West Indies, first completing a shakedown cruise and then engaging in cable and survey duty. She completed an extended tour of duty in the Pacific Ocean, followed by three years of operations based at San Francisco, California, and then in March of 1959 returned to her new home port, Portsmouth, New Hampshire. For the next three years, Aeolus repaired and laid cables along the east coast and in the West Indies. From 1962 to 1973, her primary home port was Portsmouth, New Hampshire, with temporary assignments in the Pacific. On September 21, 1973, Aeolus returned to Portsmouth, New Hampshire, to begin preparations for her transfer to the Military Sealift Command (MSC). On October 1, 1973, she was decommissioned and turned over to MSC to be operated by a civil service crew. She continued to serve actively as U.S.N.S. Aeolus until May of 1985, at which time she was laid up with the Maritime Administration’s National Defense Reserve Fleet at James River, Virginia. Aeolus was struck from the Navy list on February 28, 1985, and was then transferred to North Carolina for sinking (in August of 1988) as an artificial reef. Today Aeolus lies covered with soft corals and sponges in 110 feet of water approximately 22 miles from the Beaufort inlet. Like other ships that were sunk as part of North Carolina’s artificial reef program, Aeolus is now a popular site for divers who wish to explore the marine life off the Atlantic coast.